UPSC questions related to the topic ‘culture’ are not so easy to prepare. The main reason being lack of quality study materials which explain the same in simple language. Architecture is an important area inside the culture topic. In this article, we shall see the details of the Chola Temple Architecture, which is an important part of Dravidian temple architecture. UPSC had asked a question related to this topic in 2013 mains. The question was : Chola architecture represents a high watermark in the evolution of temple architecture. Discuss. We shall see the answer, but before going into the details of Chola architecture, let’s make our fundamentals strong. Ever since the temple building process began, the architecture reflected a synthesis of arts, the ideals of dharma, beliefs, values and the way of life cherished under Hinduism. Nagara, Dravida, Vesara etc are different styles of temple architecture. Pallavas (7th century – 9th century) and Cholas (9th century -11th century) were the major kingdoms which epitomized the Dravidian Architecture. Chalukyas (7th century -11th century) followed Vesara style of architecture in the Karnataka region. Their style is also known as Karnata Dravida style. Chalukya art was followed by Hoysala art (13th century). Pallavas used bricks, lion motifs, dwarfed gopurams etc. Things changed at the hands of Cholas. They used stones instead of bricks. Walls were decorated with sculptures and paintings of deities, kings and queens (not lion motifs). Temples have enclosed decorative walls and entrance (Gopuram). They also have an audience hall known as Mandap. The deity room is known as Garbhgriha. The pyramid like storey above the deity room is known as Vimana. 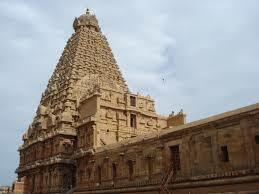 The Dravidian temple architecture started by the Pallavas got matured at the hand of the Cholas. Some prominent features of temple architecture in the Chola dynasty are enunciated here. These are characteristic architectural designs of Chola temples carved in temple walls. These are decorative niches of chola temple walls where deities are sculpted. These magnificent architectural designs are carved as projection in walls with placing of deities within it. The pilasters are positioned in both sides of the main devakusthas. These are narrow niches in chola temple walls with special design for placing sculpted images. These are two lion heads which crowns the curved roof of the pilasters. Makar along with warrior heads positions below all the decorative devices. It is a rounded structure placed on the basement of temple sculpture or motiff sometimes decorated with ribs. The base of the walls of chola temples are decorated with lines of mythical animals called yazhi. Arthamandapa, nandi mandapa with special decoration are characteristics of Chola temple architecture. Besides the main shrine, Chola temples were evidences of subsidiary shrines for other deities called parivardevatas which were highly decorative. These are some prominent directions transparent in Chola temple with architectural design for placing of deities. The walls of Chola temples are seen with inscriptions with architectural design. Chola abandoned it and used yazhi at base or kudus in other parts of the pillar. Dwarapala – In pallava architecture dvarapalas are comparatively benign. In chola architecture dwarapala became fierce with protruding tusk. Gopuram – The gopurams in pallava dynasties were comparatively dwarfed. But in chola dynasty they became enlarged with high enclosure walls. Finial – The finial in Pallava dynasy was a little swelling in the top of the vimana. But in Chola dynasty it became beautiful vase with artistic design. Apart from the discussed features, Chola temples had a beautiful shikara stone at the top. It had elaborate and carefully made carvings. It is a marvel how these structures weighing in tonnes is placed without the help of cranes. During their reign, Cholas made temples in Nagaeshwvara, Brihadeshwvara, Airavateshwara and Chidambaram. Other kingdoms in South India and Sri Lanka followed their style. great source of useful information. can i get some more info about ancient literature ?